It doesn’t take too much effort to see that we already have more than a little common sense gun control. In fact, we have so much that Grabbers probably couldn’t stomach reading it all. Let’s have a look at what’s on the books. See what they did there? They tried to make it so only rich people could have them. In 1934, $200 would have been a major obstacle for the average American. It was an attempt to ban by taxation. The NFA Handbook, provided in electronic form only, has a table of contents showing 207 pages. It identifies NFA-regulated weapons and devices, which include some shotguns, weapons made from shotguns, some rifles, weapons made from rifles, weapons described as “any other weapon”, machineguns, silencers, destructive devices, explosive devices, and large caliber weapons. If you think showing a state-issued ID is too great a burden to vote, how do you feel about filling out federal forms, passing a background check, and paying $200 for each ballot? Just so we’re clear, fully automatic weapons DO have a reasonable relationship to the preservation or efficiency of a well-regulated militia. So, either the court was right about its interpretation (which means the Second Amendment guarantees the right to keep and bear military weapons) or the court was wrong about its interpretation (which means suitability for military service is not the defining factor) and Miller got screwed by the Federal government. Among other things, this law increased the minimum age to purchase a handgun to 21. It also prohibited interstate trade in handguns. Can anyone name another civil right unavailable to citizens until they are 21? “Amends the Federal criminal code to define “armor-piercing ammunition as projectiles constructed from specified material which may be used in handguns. Excludes from the definition: (1) shotgun shot required by Federal or State regulations for hunting; (2) frangible projectiles for target shooting; or (3) projectiles that the Secretary of the Treasury determines are primarily intended for sporting purposes or industrial use. Makes it unlawful for any person to manufacture or import armor-piercing ammunition. Allows for: (1) the manufacture or importation of armor-piercing ammunition for the use of the United States or any State or local government; (2) the manufacture for the sole purpose of exportation; and (3) the manufacture or importation for testing or experimentation authorized by the Secretary. Allows for the sale and delivery of armor-piercing ammunition for these purposes. Does anyone know of a case where a would-be mass murderer was stymied by this legislation? This was also known as the Violent Crime Control and Law Enforcement Act, which was a subsection of the Public Safety and Recreational Firearms Use Protection Act. Democrats are really into banning guns based on appearance. Doxing is not new, that’s why this amendment was necessary. Imagine being an honest gun dealer today, without such protection. The news expresses outrage over a trendy tragedy du jour. Then the threats pour in, choking your phone lines, your website, and your social media. Then the SJWs begin to protest outside your store: they block traffic and harass your customers at first, possibly assaulting, trying to provoke a reaction. Then the SJWs dox your customers and harass their employers. That’s the best case scenario. The Left has openly embraced violence through Antifa and other groups. Vandalism, assault, arson, bombing, vehicle attacks, and gun violence are not out of the question… and any response by the owner, the employees, or the customers will be probably be portrayed unfairly if at all possible. This was necessary because lawsuits were being filed against lawful companies for the actions of unlawful individuals. What would the auto industry look like if car manufacturers and dealerships could be taken to court for damages caused by drivers convicted of crimes involving automobiles? The merits of the cases would be irrelevant; the expense of legal defense would crush such businesses (which, of course was the plan with firearms). The Left perpetually makes the absurd claim the Second Amendment—unlike every other civil right—was somehow a governmental right and not a right of the people. Heller affirmed the Second Amendment was an individual right unconnected with service in a militia. Under the President Obama administration, the Bureau of Alcohol, Tobacco, Firearms and Explosives (ATF) proposed a ban on a very common 5.56 mm cartridge which had previously been exempt from the Law Enforcement Officer Protection Act due its widespread use in shooting sports. President Obama’s administration dropped the idea after private citizens, lobbyists, and 238 members of House of Representatives opposed it. President Obama’s administration banned the use of lead ammunition on most federal lands, it was later reversed by President Trump’s administration. A lead ammunition ban isn’t necessarily a bad thing, but it does show there is no lack of governmental interference in weapons and ammunition. California has 218 pages of laws and ordinances. It has some of the country’s most extreme gun control laws, yet it still has plenty of shootings, even mass shootings. How is this possible? Cough—San Bernardino—cough! How many more gun control laws will be enough? Is there a magic number? If so, it must be pretty high. 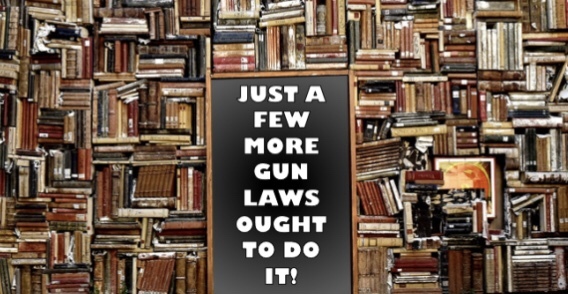 All of the laws on the books now don’t seem to be sufficient. When a gun grabber says we need to take action, ask him or her, “What specifically should the law say?” Don’t let them get away with invoking the UK or Australia. Press them until they spell it out. Then ask them, “Are you sure that isn’t already a law? Let’s look together, shall we?” A quick web search may find that such a law is already on the books somewhere. California and New York are good places to look.